Since its founding in 1825, Sellier & Bellot has not stopped manufacturing some of the best ammunition in the world. As a key manufacturer in the Czech Republic, this company is one of the best ammo manufacturers in Eastern Europe and is greatly looked up to. 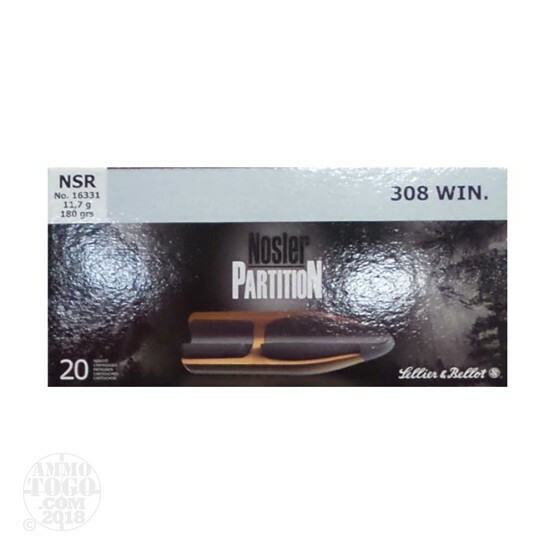 Sellier & Bellot know that you expect the best ammunition from them, and therefore they loaded Nosler Partition projectiles in these 308 rounds. These 180 grain Nosler Partition bullets are designed to deliver fantastic terminal performance with controlled expansion and consistent penetration. Need to reload? Not a problem, these rounds are loaded into fresh brass casings with boxer primers, ripe for reloading bench.